Did Presidential Jet Prevent Faulty Dana Plane From Landing Before Crash? hmmmm! I can’t say for sure if this story is true, but I’m personally left with loads of questions after reading it. The article you are about to read was published on dimokokorkusstella.blogspot.com. “Is there any way of getting confirmation about news I’m just getting that the Dana plane was distressed for a while but could not make an emergency landing because the airspace was closed for 2 hours for the Presidential Jet carrying Dame Patience Goodluck Jonathan. Private jet owners who had to hover in the air same time leaked this. This was apparently the reason local news didn’t report the crash for so long till CNN and foreign news stations started reporting it. Local news was ‘blacked out’ trying to kill the story of the airspace being closed while a distressed plane couldn’t land. It would be shocking if so. Though there was engine failure there was still time for the plane to have landed apparently. You do know anyway that the airspace is closed for up to 2hours each time the Presidential Jet needs to go into the air? 2 hours for a 15minute take off or landing! And this jet is used by President, VP, President’s wife and if I recall David Mark. Nigerians need to know what happened?who closed the airstrip for two hours on Sunday June 3,2012???? These and many other questions should be answered by the ongoing investigation if we ever get a wind of it. A colleague who lives in Iju actually confirmed that the aircraft hovered around for about 40 minutes from his own calculations, another friend of mine who was billed to travel out of Lagos on Sunday with Arik Air says their flight was delayed for 1 hour, before they witnessed the ill-fated crash that killed 153 passengers and over 10 others in the densely populated Iju-Ishaga area of Lagos. The question still remains, Why??? So far NEMA has reported that about 150 bodies have been recovered as at Tuesday, and bereaved families are at the Lagos State Teaching Hospital to identify the corpses. The government of the United States of America has offered to assist Nigeria in the investigation of the Dana Airlines plane crash that killed about 163 people in the Iju-Ishaga area of Lagos State. According to local news agency, Premium Times, the US extended its condolences to affected families in a statement made available to the News Agency of Nigeria in New York US noting it to be one of the worst air disasters in West Africa. State Department spokesman, Mark Toner, said earlier that some U.S. citizens were among the 153 passengers aboard the plane that crashed into the densely populated Iju Ishaga area, reports earlier on Tuesday said that a Houston family and two sisters who are Americans were involved in the crash. According to a report by AP, a family of six from West Hartford, Connecticut were victims of the Dana Plane crash. The Tuesday edition of the Hartford Courant newspaper identified the family as Maimuna Anyene, her Nigerian husband Onyeke, and their children, a 5 month old, 1-year-old twins and a 3 year old. The AP report also cites the Houston Chronicle who reported Tuesday that the crash also killed Josephine and Jennifer Onita, sisters from Missouri City, Texas. President Goodluck Jonathan on Sunday declared three days of national mourning for the victims of the crash, while the Lagos state government cancelled all official engagements for one week of mourning. (AFP)-Nigerian rescuers recovered burnt human remains as investigators probed for clues on Monday after a plane slammed into a Lagosneighbourhood, with all 153 on board killed and more feared dead on the ground. Police fired tear gas at a surging crowd seeking to get a look at thecrash site at one point on Monday morning, while at other spots around the site people desperately sought access to the wreckage to locate missing relatives. They were denied access, with rescue workers combing the scene of the crash — the world’s worst air disaster so far this year — saying the bodies were unrecognisable. “I just want to be sure of how he died,” one man told rescue workers of his brother. Wreckage still smouldered at the grisly site near the airport in one of Africa‘s largest cities as two cranes cleared away debris and a few thousand onlookers gathered. Local media reported that the crash of the Dana Air Boeing MD83 was Nigeria’s worst since 1992, when a military C-130 went down after takeoff in Lagos, killing all 200 on board. There have been a number of other crashes with more than 100 victims over the past decade in Nigeria but the most recent was in 2005. Rescue workers had pulled at least 62 bodies from the wreckage by Monday morning, a rescue official said. President Goodluck Jonathan, who declared three days of national mourning, was due to visit the crash site Monday, a spokesman said. At least one of the plane’s two cockpit recorders had been recovered, officials said. The aviation minister said the flight had declared an emergency 11 nautical miles from the airport but the cause of the crash remained unclear. The flight disappeared from radar one minute after having declared the emergency at 3:43 pm local time (1443 GMT), a statement from the minister said. An aviation source said the pilot had told the tower that he was experiencing problems with the plane, but further details were not yet clear. The plane, which was flying to Lagos from the capital Abuja, crashed near the airport, damaging buildings and setting off an inferno in the poor and densely populated neighbourhood located in the city’s northern outskirts. Chaos broke out after the crash, with rescue workers facing large crowds and aggressive soldiers while trying to access smoldering wreckage in the hunt for survivors. While tear gas was fired at one point on Monday morning, the scene was generally much more calm, with a heavy security deployment in place. Nigeria has a spotty aviation record, although Dana had been considered to be a relatively safe and reasonably efficient domestic airline since it began operating in 2008. 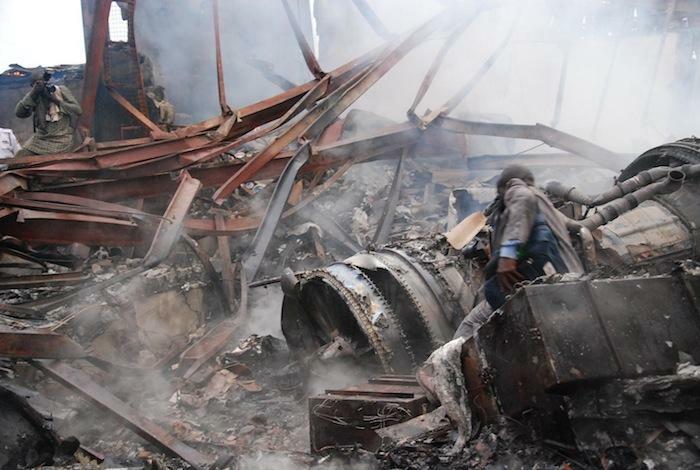 A spokesman for Nigeria’s Accident Investigations Bureau said all 153 people on board the plane were considered dead. The number of those killed on the ground was unclear. A spokesman for the airline said the plane was carrying 147 passengers and six crew. China said six of its nationals were on the plane. In the aftermath of the crash, thick smoke rose from the area and flames could be seen shooting from a two-storey building. Thousands of onlookers had partially blocked access to the crash site on Sunday, prompting soldiers to try to clear out the area, using rubber whips and their fists. One even threw a wooden plank at those crowded around. The area plunged into all-out pandemonium when a helicopter tried to land amid the crowd, kicking up clouds of ash and light debris that again scattered people in various directions. Some residents said it appeared that the plane had nosedived into the neighbourhood while others described it as swaying back and forth before crashing. An official with the National Emergency Management Agency said the plane had crashed into two buildings, a church and the two-storey residential structure. At least three people had been transported for treatment with relatively minor wounds, he said, in addition to the bodies pulled out of the wreckage. The president’s office said in a statement that Jonathan had “directed that the Nigerian flag be flown at half-mast for the three days of national mourning. “Meanwhile, the president has ordered the fullest possible investigation into the crash,” it added. Lagos, the largest city in Africa’s most populous nation, is home to an estimated 15 million people. The accident followed another plane crash Saturday in the capital of nearby Ghana, when a cargo plane overshot a runway and hit a passenger bus, killing at least 10 people. Devastating fire incidents in Nigerian homes are sometimes blamed on faulty cooking kerosene stoves or open cooking fires left unattended by residents. According to experts, more than 95,000 Nigerians die each year from inhaling toxic smoke emitted from rudimentary cooking stoves. Recently, a UN-linked organisation Alliance for Clean Cookstoves launched a campaign for the environment friendly cooking stoves in the country to help prevent the deaths caused by the inhalation of toxic smoke. Yahaya Ahmed, director Developmental Association for Renewable Energies and member of the Alliance for Clean Cook stoves, said the new cook stoves were energy efficient, used only a fraction of firewood or charcoal compared to other stoves in the market and did not emit toxic smoke. He added that the stoves are aimed at the low income population of the country that still cannot afford electricity or gas for cooking. “These stoves have been more affordable through carbon finance, carbon finance meaning that companies and countries who are polluting a lot in the world and causing global warming have provided money that is used to subsidize the costs of these stoves, so these stoves are so low priced that they can compare with kerosene stoves,” he said. Although Nigeria holds the world’s seventh largest gas reserves, and is amongst top oil producing countries, more than 100 million Nigerians do not have access to electricity or gas for cooking and use kerosene which itself is very scarce in supply, even though Nigeria is a major oil and gas country. Carol Nwosu, a resident of Abuja says she uses kerosene stoves and sometimes firewood to cook because she can not afford the costs of running a generator or cooking gas, despite the harm that these stoves poses. “Using kerosene stove, may be you finished cooking and you want to put off your stove, the whole atmosphere, most especially when you are cooking inside the house, you discover that when you put of the stove, the house will be smelling one offensive odor like that, another disadvantage I see using kerosene is that it blackness the pots,” she said. Alliance for Clean Cookstove aims to equip at least 10 million Nigerians with the new cook stoves by 2020 and hopes to achieve the half a million mark within the next 12 months.